Partner certification programs are certainly not new in the technology sector. Many products and services are complex and require a deeper understanding in order for a partner to appropriately sell, manage and support their client while also maintaining a high customer satisfaction rate. Intermedia, however, didn’t require partners to go through certification in order to sell its products and services. Until now. With the development and release of our new Unified Communications as a Service (UCaaS) product, Intermedia Unite™, we were left with a question that could lead to a potential issue: how do we enable the partner community to be successful in this crowded market? Intermedia Unite is not just an upgrade from our previous Cloud PBX offering, but an entirely new all-in-one Unified Communications and Collaboration platform. Given the solution-oriented nature of UCaaS, we decided early on that it would be important to require our partners to complete a certification training around Intermedia Unite in order to help them achieve success and ensure a better overall selling and buying experience. The Intermedia Unite Certification is our first certification program and enables our partners to become experts in selling, setting up and supporting our new Intermedia Unite product. The training content is designed to speed up the time that a partner would typically take to become proficient selling a new product. Plus, all training content is available to our partners and their teams as a resource after completing the certification. So you can easily get new hires trained up quickly and offer refresher training to existing staff at will. If you are an existing partner, simply log into the Partner Portal and go to Intermedia University. From there, enroll in the Intermedia Unite Certification learning plan, either for our Private Label or Advisor partner models. Frost & Sullivan expect the UCaaS market to grow significantly over the next several years. Customers are looking for more robust features, flexibility in how they communicate and, above all, reliability. Selling Intermedia Unite, along with Intermedia’s other robust cloud-based products, allows partners to confidently say “yes” to their customers more frequently while maintaining a high level of customer satisfaction. 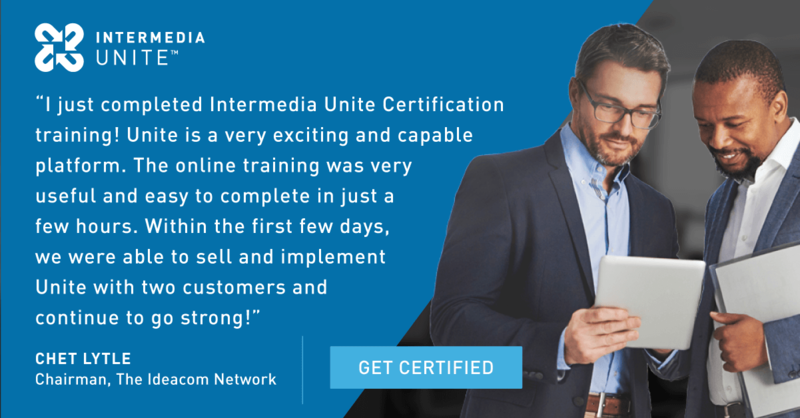 Get certified today so that you can start selling Intermedia Unite! The support and billing elements of selling voice can certainly eat up your profits if you’re with the wrong partner. But at Intermedia, we do things differently.